Palestinian scholar of the fourth century, whose name is mentioned but once, in the Babylonian Talmud, and then only as the reporter of a homily of Simeon b. Laḳish, which reproves the wickedness of the courts with the following words: "'Your hands are defiled with blood' (Isa. lix. 3) refers to the judges, whose hands are ever open to receive bribes; 'your fingers with iniquity' (ibid.) refers to the judiciary's scribes, who write false or specious documents; 'your lips have spoken lies' refers to the lawyers, who misconstrue the law, or instruct their clients how to plead; 'your tongue hath muttered perverseness' refers to the litigants, who plead falsehood" (Shab. 139a; Rashi ad loc.). 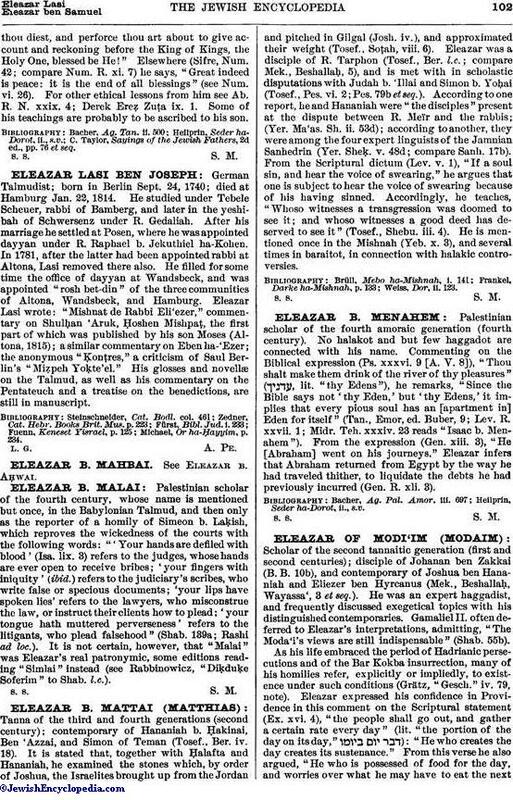 It is not certain, however, that "Malai" was Eleazar's real patronymic, some editions reading "Simlai" instead (see Rabbinowicz, "Diḳduḳe Soferim" to Shab. l.c. ).